Drug developers often defend the sky-high prices of new treatments in terms of value to patients, but there’s little doubt new medicines offer value of another kind to biopharmas—namely the ability to generate profits by recouping years, sometimes decades, of sky-high R&D, trial, and commercialization costs. While none of last year’s newly launched treatments reached the billion-dollar threshold of a “blockbuster,” one new drug, ranked among the five that racked up more than $100 million in sales, came close. Ten new treatments that reached the market during 2015 generated $10 million to $100 million. Another eight new launches made less than $10 million, all of them ranking too low to be included on this list. The eight were Praluent® (Sanofi/Regeneron), Afrezza® (MannKind and, until January, Sanofi), Aristada™ (Alkermes), Ninlaro® (Millennium: The Takeda Oncology Company), Onivyde™ (Merrimack Pharmaceuticals), Empliciti™ (AbbVie and Bristol-Myers Squibb), Cotellic™ (Roche/Genentech), and Nucala® (GlaxoSmithKline). For those treatments, and the ones that are ranked, developers have furnished sales figures publicly through regulatory filings and/or press releases. As in the past, many companies did not disclose how much money their new drugs generated last year. Some of those were privately held companies, such as Wellstat Therapeutics (which launched Xuriden™, the first FDA-approved treatment for hereditary orotic aciduria), Symplmed Pharmaceuticals (Prestalia® for hypertension), and LEO Pharma (Enstilar® for psoriasis). Two drugs launched in December also had no sales disclosed individually: Eli Lilly’s Portrazza™ for metastatic squamous non-small cell lung cancer, and Relypsa’s Veltassa™ for hyperkalemia. Also among unreported sales figures were those for Saxenda®, Novo Nordisk’s therapy for chronic weight management as an adjunct to diet and exercise; Kengreal™, The Medicines Co.’s drug to prevent blood clots in coronary arteries; Rytary™, the Impax Labs treatment for Parkinson’s disease; Varubi®, the chemotherapy-related nausea and vomiting drug marketed by Tesaro under license from Opko Health; two Johnson & Johnson cancer treatments, Yondelis® and Darzalex™; two Novartis therapies with cancer indications, Odomzo® and Farydak®; and three Amgen treatments (chronic heart failure drug Corlanor®, melanoma therapy IMLYGIC™, and cholesterol medication Repatha™). Another 2015 launch, the hypoactive sexual desire disorder medication Addyi™, is marketed by Valeant Pharmaceuticals International, which at deadline had yet to report 2015 results. Also not released are sales numbers for Praxbind®, launched in October as the first reversal agent for Pradaxa® (dabigatran etexilate mesylate), by Boehringer Ingelheim, which usually reports annual results in the spring. Following are the 15 drugs launched in 2015 whose companies furnished 2015 sales information, allowing for ranking. 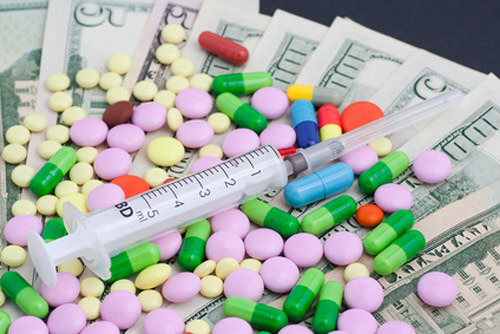 Drugs are listed by trade name (U.S./Europe where it varies), generic name, 2015 sales, the sponsor company or companies marketing the drug, and indication. This list does not include drugs launched in the U.S. last year if they were launched elsewhere in the world earlier. Nor does it include drugs approved in 2015 but launched or set to launch this year, which would apply to Actelion’s Uptravi® for pulmonary arterial hypertension, Alexion Pharmaceuticals’ Kanuma™ for lysosomal acid lipase deficiency, and AstraZeneca’s Zurampic® for gout-associated hyperuricemia. Indication(s): Perinatal/infantile- and juvenile-onset hypophosphatasia. Indication(s): Invasive aspergillosis; invasive mucormycosis. Indication(s): For patients with metastatic epidermal growth factor receptor (EGFR) T790M mutation-positive non-small cell lung cancer, as detected by an FDA-approved test, who have progressed on or after EGFR tyrosine kinase inhibitor therapy. Indication(s): Indicated in combination with granulocyte-macrophage colony-stimulating factor (GM-CSF), interleukin-2 (IL-2), and 13-cis-retinoic acid (RA), for the treatment of pediatric patients with high-risk neuroblastoma who achieve at least a partial response to prior first-line multiagent, multimodality therapy. Indication(s): Reduces the risk of cardiovascular death and hospitalization for heart failure in patients with chronic heart failure (NYHA Class II–IV) and reduced ejection fraction. Indication(s): Adjunct to calcium and vitamin D to control hypocalcemia in patients with hypoparathyroidism. Indication(s): Opioid-induced constipation in adult patients with chronic noncancer pain. Indication(s): Indicated as a complete regimen for the treatment of HIV-1 infection in adults and pediatric patients 12 years of age and older who have no antiretroviral treatment history, or to replace the current antiretroviral regimen in those who are virologically suppressed (HIV-1 RNA less than 50 copies/mL) and on a stable antiretroviral regimen for at least 6 months with no history of treatment failure and no known substitutions associated with resistance to the individual components of Genvoya. Indication(s): Adjunctive therapy to antidepressants for the treatment of major depressive disorder; treatment of schizophrenia. Indication(s): Locally recurrent or metastatic, progressive, radioactive iodine-refractory differentiated thyroid cancer. Indication(s): Indicated to improve glycemic control in adults with diabetes mellitus. Sponsor(s): GlaxoSmithKline (acquired as part of GSK’s purchase of Novartis’ noninfluenza vaccines business for $5.25 billion in a deal completed on March 2, 2015. Indication(s): Active immunization to prevent invasive disease caused by Neisseria meningitidis serogroup B. Bexsero is approved for use in individuals 10–25 years of age. Indication(s): Moderate to severe plaque psoriasis in adult patients who are candidates for systemic therapy or phototherapy; adults with active psoriatic arthritis (approved January 2016 by the FDA); adults with active ankylosing spondylitis (approved January 2016 by the FDA). Indication(s): Cystic fibrosis in patients age 12 years and older who are homozygous for the F508del mutation in the CFTR gene. If the patient’s genotype is unknown, an FDA-cleared CF mutation test should be used to detect the presence of the F508del mutation on both alleles of the CFTR gene. 1 Sum of ¥0.4 billion in Q4 2014 (January-March 2015) and ¥7.7 billion in Q1–Q3 2015 (April–December 2015). 2 Indication approved under accelerated approval based on progression-free survival. Continued approval for that indication may depend on verification and description of clinical benefit in a confirmatory trial.